The most important of these begins with Maundy Thursday - or Holy Thursday - observed because that was the day in which Christ and his followers gathered for the Jewish Passover Seder. For Christians, this was the "Last Supper" during which Christ instituted the Christian concept of sharing communion. On the same evening, Christ later endured the "Agony in the Garden" in which he prayed for strength to perform his ultimate act of sacrifice - death by crucifixion. Christ's fate was sealed when he was finally betrayed for "40 pieces of silver" at the hands of one of his own followers, Judas Iscariot. Good Friday, one of the most somber days in the Christian calendar, marks the day of Christ's crucifixion. Today, many Christians observe the hours between noon and 3 PM with silence, prayer and meditation on the Passion of Christ, and it is a Roman Catholic tradition to visit three different churches during this time and to pray the "Stations of the Cross" at each church. 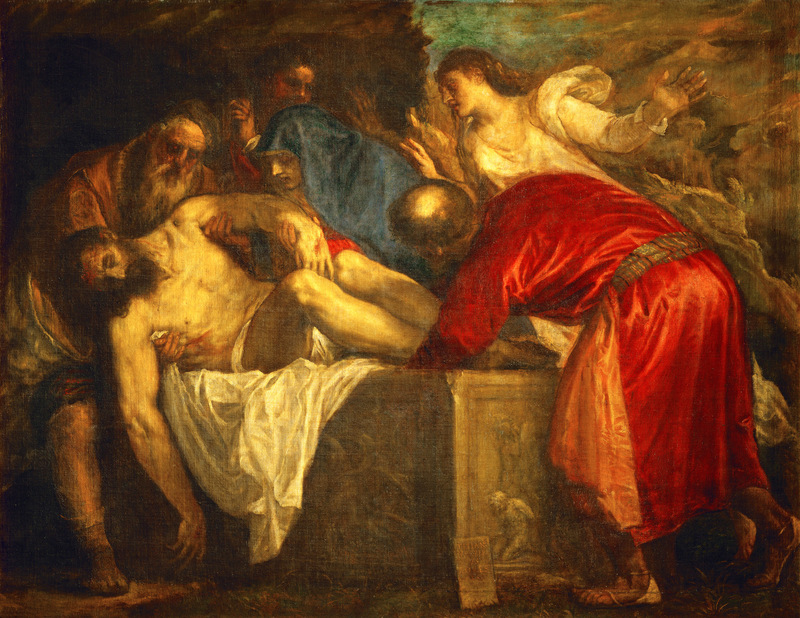 Saturday "Entombment of Christ" by Titian; and Easter Sunday "The Resurrection of Christ" by Noel Coypel. Holy Saturday commemorates the day Christ remained buried in a tomb, the darkest day for early Christians. Since Jewish law would not allow any of the preparations for burial to be carried out on the Sabbath, the tomb was closed to keep the body safe until the mourners returned on Sunday. When Christ's mother Mary returned to the tomb in the morning to prepare the body of Christ for burial, the tomb was open -- and an angel proclaimed that Christ had been miraculously resurrected! Easter Sunday is the celebration of the joyous news of Christ's triumphant victory over death. In Spain, Mexico and many other Latin countries, Semana Santa - Holy Week - is a time of processions, candlelit services and religious traditions. Around the world, special foods are served based on the traditional Lenten meatless fast, and festivities are held throughout the entire week in preparation for Easter Sunday. On Line Resources for Holy Week - Check out a virtual online encyclopedia of every top resource on the subject including related art & music, activity ideas, and Passover/Seder resources. The Days of Holy Week - Here's more on Holy Thursday, Good Friday, Holy Saturday and Easter including related Biblical quotes.